Galveston’s popular Bathing Beauties have a new place to call home as Beach Central, located adjacent to the Hotel Galvez & Spa®, plays host to the annual Galveston Island Beach Revue through 2016. Officials for both the hotel and the promoters of the Galveston Island Beach Revue, Islander By Choice, LLC., recently agreed on the move to the Seawall property. The Galveston Island Beach Revue, scheduled on May 16 and 17th, is Galveston’s official kick-off to summer. The Beach Revue is free to the public and offers a weekend of family-friendly events headlined by the Bathing Beauties Contest. Hotel Galvez & Spa®, A Wyndham Grand Hotel, is the title sponsor of the event. The annual event, held the third weekend of May, will once again benefit Galveston’s Family Service Center with a percentage of profits going towards the Island non-profit. For those interested in joining the ranks of Bathing Beauties, registrations for the 2014 contest will open on Saturday, February 1 and are limited to the first 40 accepted applicants. Information on the event can be found at www.galvestonbeachrevue.com. Dubbed the "Pageant of Pulchritude" by C.E. Barfield, Galveston's Bathing Beauties Contest began in the summer of 1920 and marked the kick-off for tourist season each year. By 1928, the event, which had morphed into the "bathing girl revue" had become so popular, the Island's population was said to have tripled during the event weekend. These Island pageants were the beginning of what we know today as the Miss Universe Pageant. 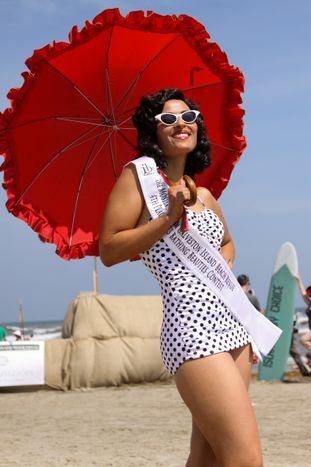 The famed Galveston Bathing Beauties pageants ended in 1932 due in part to the Great Depression and were resurrected in 2009 by Islander By Choice, LLC. Hotel Galvez & Spa®, A Wyndham Grand® Hotel and National Trust Historic Hotel of America, is the only historic beachfront hotel on the Texas Gulf Coast. This 224-room, century-old hotel offers 13,000 square feet of meeting space, a 9,763-square-foot spa, fitness center, full-service restaurant, lobby bar, pool with a swim-up bar and Hall of History. The hotel is rated four diamonds by AAA and is owned by the Cynthia and George Mitchell family as part of Mitchell Historic Properties. For reservations, call (800) WYNDHAM, or visit www.WyndhamHotelGalvez.com. For more information on the Sixth Annual Galveston Island Beach Revue presented by Hotel Galvez & Spa®, please contact Adrienne Culpepper, Event Coordinator, at 409-770-7360 or adrienne@ibcgalveston.com or visit www.galvestonbeachrevue.com. The 2014 Galveston Island Beach Revue is May 16 and 17, 2014.Title Sponsor for the event is Hotel Galvez & Spa. Pictured is Christine White, 4th Place Runner Up, for the 2013 Bathing Beauty Revue.